The Aston Martin DB5. Possibly the most recognised car in the world, thanks to one less-than-careful previous owner, namely James Bond, oo7. 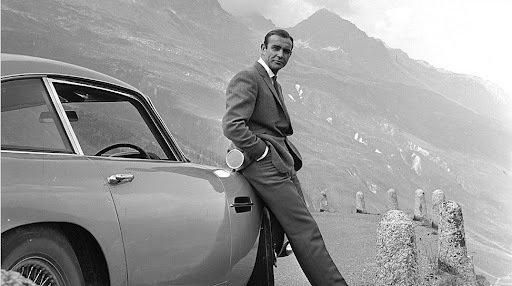 In the novel Goldfinger, Ian Fleming gave Bond the Aston Martin DB Mk III to temporarily replace his usual Bentley, which he takes from the Secret Intelligence Service’s car pool. Bond chooses between the Aston and a Jaguar, feeling that there was little between them, but that Aston had the slight edge. Ironically, this same decision arose when looking for Bond’s car during the pre-production of the film Goldfinger . The Jaguar E-Type was to have been Bond’s car if Cubby Broccoli had had things his way, however Sir William Lyons refused to lend the production the three Jags Cubby requested. So, Cubby turned to his second choice, the Aston Martin DB5. This decision would change the identity of the marque forever, helping to create one of the world’s most iconic vehicles and forever associating Aston Martin with James Bond. Jaguar are still playing catch up to this day. But what of this particular car that became so famous? In the novel, the DB III has a few tricks up its sleeve, such as a hidden gun compartment and reinforced steel bumpers, but nothing like the additional armament that production designer Ken Adam devised for it. The extras on the DB5 that had audiences gasping were truly the product of Ken’s fertile imagination and the car’s iconic status is due in no small part to his to his efforts. 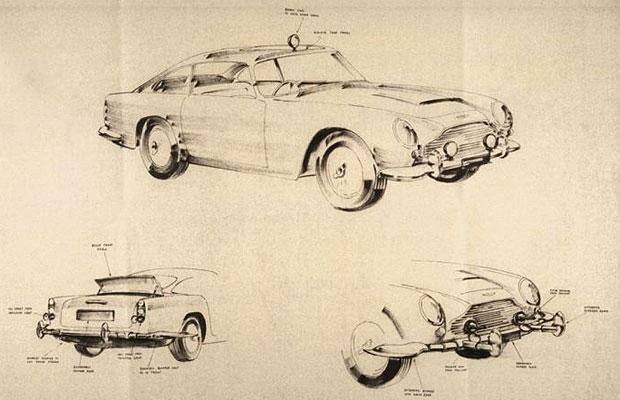 Ken Adam’s production sketches for the DB5. 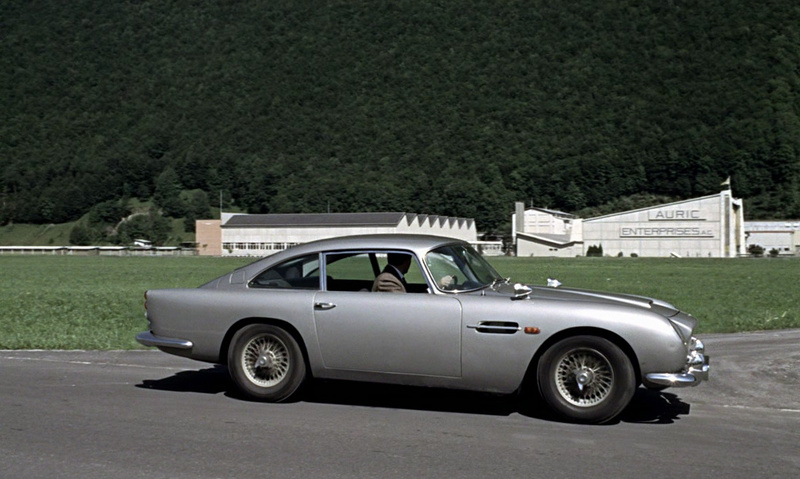 However, only two DB5s were used for the filming of Goldfinger: A standard DB5 known as “The Road Car”(chassis DB5/1486/R), which was used for the driving and high speed chase sequences, and “The Gadget Car” (chassis DP/2161/1), which was used for the stunt and effects sequences. Sean searches for his balls at Stoke Poges Golf Club. The Gadget Car, which belonged to Aston Martin and was actually a modified DB4, can be rightly considered to be the prototype DB5. It is this car that first had all the modifications put into it (The Road Car initially was left as standard, only later being fitted with all the extras for promotional purposes and to capitalise on the films’ success). So it is this Gadget Car that, for all intents and purposes, is the DB5 that we all associate with Goldfinger and James Bond. This particular car has had a chequered history. Astonishingly, after the filming on Goldfinger was complete, Aston Martin stripped it of all of its gadgets and gear and put it up for sale as a “used car” with 50,000 miles on the clock. It was sold in 1968 to Gavin Keyzar, who had no idea that this was the vehicle that had been made famous by James Bond. As soon as he realised its significance, Keyzar had a specialist company re-install all the gadgets to capitalise on the car’s cinematic history. It was later sold on to Richard Loose and made an appearance in film The Cannonball Run, this time driven by Sir Roger Moore, who was playing James Bond at the time. Loose also owned the Rolls Royce Phantom III, driven by Goldfinger’s character in the film, and he sold this, along with the DB5, at an auction in New York through Sotherby’s in 1987. 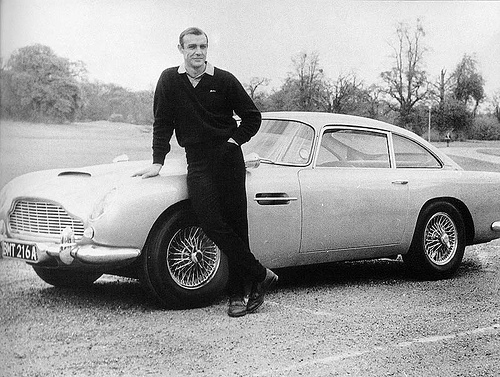 The next owner of the DB5 was Anthony Pugliese, a developer from Florida, who purchased the car for $275,000 US. In the 90s, Pugliese had the car appraised at a whopping $4 million and had it insured for $3.2 million – not small change by any standards. So, rather than keep it parked up in his garage, he stored the car in an secure airport hangar in Boca Raton, Florida, where the most intriguing part of the story takes place. Late one night in in 1997, in a covert mission worthy of James Bond himself, the car was stolen. The intrepid thief cut through the hangar door molding, sliced through through the bolts, and bypassed the alarm system. In all likelihood, a truck was used to pull the hangar door off its hinges and, as evidenced by the tyre marks, was then used drag the Aston to a small cargo plane, which is oddly reminiscent of the break into Fort Knox in Goldfinger. The DB5 has never been seen since. Not quite as strange as the fate of The Gadget Car, but almost as intriguing is the story of the other Goldfinger DB5, The Road Car, the standard spec DB5 that had been lent to EoN by Aston Martin for the driving sequences. Bond observes Auric Enterprises from an inconspicuous position. 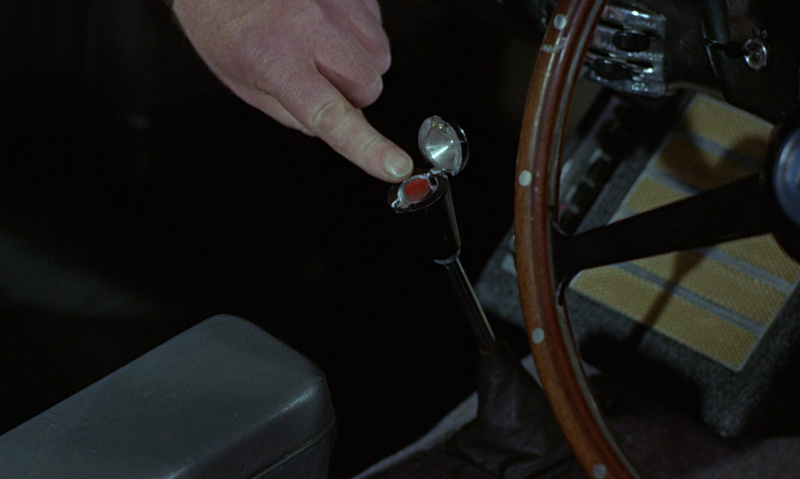 This car initially had no gadgets, but was fitted with the full compliment to promote Goldfinger. However, upon its return to Aston Martin, this too was stripped of all its paraphernalia and resold as a used car in 1968. The mind truly boggles as to what they must have been thinking. This car was sold to an American named Jerry Lee in 1968. At the time the car was in a pretty sorry condition. It was spruced up by Aston Martin and it went on to be proudly displayed at motor shows, until it was accidentally damaged at a car show in Memphis, Tennessee. After this, Lee vowed never to display it again. However, in 1977, the chairman of Aston Martin U.S.A. asked Lee if he would allow the car to be displayed at the New York Auto Show. Aston Martin would pay for an overhaul and for the gadgets to be reinstalled. After some consideration Lee agreed and the car was displayed one final time. Lee now keeps the Aston in his house and has not publicly displayed it since. There are two other DB5s that were used to promote the film Thunderball. These have their own stories too, the most interesting of which is probably that they were purchased by Eon Productions from Aston Martin for almost three times their road price, due to the fact that it was Aston Martin that this time installed all the gadgets. Obviously Eon had as much sense as Aston Martin, because it sold them as a pair in 1969 to Sir Anthony Bamford (the chairman and managing director of JCB) for a mere £1500. Bamford traded one of these DB5s in a straight swap to a Mr. Luscombe-Whyte for a 1964 Ferrari 250 GTO – a car that would now fetch around $10 million US. This made Bamford the only man to own two Ferrari 250 GTOs. Sean wonders how the car got so rusty. Check out more on the history of the James Bond Aston Martin DB5 in David Worrell’s book “The Most Famous Car In The World”. ← Presidential Suite – The Whitehouse, Devon. And am still wondering at the logic of Aston Martin … lost a bit of money they did … fools. But yeah – once again, thanks – your style is really easy to get into and read. Sir Anthony Bamford is probably the most successful producer of vehicles in England, so I doubt luck had anything to do with it. So there is no luck in success?